Production and application of aerated concrete has a history more than 40 years in China. Viewing from technology point, high quality products can use 3mm special sand slurry technology to meet the construction requests and 50% energy saving goals. (When mortar joint is less than 3mm, take thermal conductivity coefficient of wall as 1; when mortar joint is more than 3mm, take thermal conductivity coefficient of wall as 1.5). Based on the history of the aerated concrete development, only high quality products can bring a prosperous market. Products conform to requirement of 04~07 grade blocks stated in GB11968-2006. Ratio of water to material: 0.6~0.65. 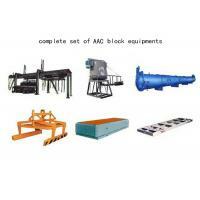 Autoclaved Aerated Concrete AAC Production Line AAC Plant used for products of AAC.